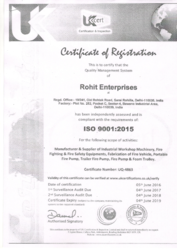 Incepted in the year of 1984, Rohit Enterprises is the leading manufacturer, wholesaler, retailer, importer and exporter of Fire Fighting Equipments, Power Press, Sheet Cutting Shearing Machine, Safety Equipments, Portable Fire Pump and many more. Our presented products are extremely used in the market for their longer service life, durability, low maintenance, top quality and top performance. These products are developed employing the advanced technology and finest quality raw material, which is procured from reliable merchants of market. Experts develop these products as per universal industry norms. Being a client’s centric firm, we also provide these products according our client’s necessities and requirements. In addition, our truthful dealing, reasonable price, well-planned ship facility, right business strategy has assisted us in upholding prominent position in the market. Moreover, we work under the guidance of our mentor Mr. Rohtash Kumar(Proprietor). Under his leadership we have achieved a prominent position in the market. His excellent industry practice allows us to attain the faith of patrons. Rohit Enterprises is a Delhi, India based company, involved in offering a wide range series of products. To complete the varied necessities of our patrons, we are providing these products in varied specifications that meet on their demand. These products are enormously used in the market due to their top features. Moreover, owing to our reasonable price structure, right business policy, wide distribution network and on-time delivery, we have been accomplished to set a mark in the market. Rohit Enterprises has tasted immense success owing to the quality and efficiency of its products. Strict compliance to the international quality standards has won us the confidence of a number of clients throughout the country. Each of our product is a perfect semblance of performance, innovation, technology, strength and quality. 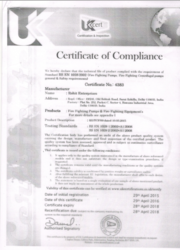 Numerous quality checks ensure that each of our firefighting equipment’s, fasteners, castings, shearing machines or workshop machines turns out to be flawless, reliable and high on performance. A dedicated team of quality analysts thoroughly analyzes each aspect of the product that determines its quality. Offering you the best products is our sole aim, and a centralized focus on this helps us to deliver the same. 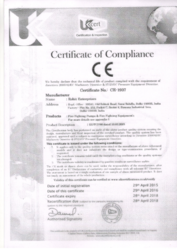 We are an ISO 9001:2015 certified company valid upto 4th June 2019. BEST PRICES, QUALITY AND TIMELY DELIVERY IS OUR STRENGTH. 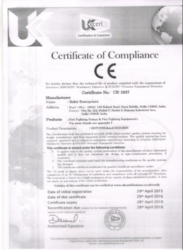 We are a CE certified company.